In the battle of two Top 25 teams and two superstars in Ariel Powers and Victoria Vivians, Mississippi State defeated Michigan State 74-72 Sunday to advance to the Sweet 16 in Bridgeport, Conn. later this week. The Spartans trailed by 6 at the half, but used an 14-0 run in the third quarter to capture a one-point lead heading into the final period. In a back-and-forth fourth quarter, Mississippi State’s Breanna Richardson knocked home a three with 34 seconds left, giving the Bulldogs a 72-69 lead. Richardson had only hit two threes prior to their match up vs. Michigan State, she finished with 12 on the night. After trailing 74-72, the Spartans missed their last two shot attempts. On the rebound of the second attempt, there was a pile of players battling and after the game the cameras showed what appears to look like Mississippi State’s Kayla Nevitt stepping on the baseline as she rebounded the ball, however, no call was made. Vivians led the Bulldogs in scoring with 24 and Morgan William added 14. Mississippi State took 28 free throw attempts, converting on 21 on them. They were also 7 for 21 from three. Branndias Agee led Michigan State with 21 points, while Tori Jankoska had 17, Jasmine Hines 15, and Ariel Powers 14. As a team, the Spartans shot 45 percent from the floor and hit 24 of 31 free throw attempts. However, Michigan State was unable to handle the basketball and committed 21 turnovers on the night, they also gave up 16 offensive rebounds. Mississippi State will face the winner of UConn and Duquesne on Saturday in Bridgeport. Baylor held Auburn to 52 points on a night where the Tigers shot just 29 percent from the field. The Bears shot 47 percent on the night and took advantage of their opportunities at the free throw line, connecting on 18 of 21 attempts. Baylor also won the rebounding battle, 48-36. Alexis Prince hauled in 13 rebounds for the Bears, Nina Davis snagged 7, and freshman Kalani Brown collected 5. Davis and Brown had 30 and 16 points respectively. Duke transfer Alexis Jones was the only other Bear in double digit scoring with 16. Auburn got 14 points from Brandy Montgomery; Montgomery was only 1 of 7 from three on the night. Tra’Cee Tanner added 13 in her final game as a Tiger, Katie Frerking was also scored in double digits with 11. Baylor advances to the Sweet 16 in Dallas to take on the winner of Texas A&M and Florida State on Saturday. In a balanced scoring effort, South Carolina defeated the Kansas State Wildcats 73-47. SEC Player of the Year A’ja Wilson picked up two early fouls in the game and was forced to sit on the bench, but teammates Alaina Coates and Tiffany Mitchell picked up the scoring in her absence. Wilson finished the night with just 8 points and 5 rebounds in 15 minutes of play. Coates had a double-double with 14 points and 10 rebounds and in her final game in Colonial Life Arena, Mitchell netted 20 points. 9 of 11 Gamecocks were in the scoring column with 3 or more points. South Carolina was also able to out-rebound Kansas State 47-32 on the night. The Wildcats had just one player with 10 or more points, 6’5” junior Breanna Lewis scored 21 points and grabbed 9 rebounds vs Dawn Staley’s Gamecocks. Kansas State shot just 32 percent from the floor, including 14 percent from three. South Carolina will play Syracuse Friday evening in Sioux Falls, South Dakota for the right to advance to the Elite 8. After a disappointing regular season, and earning the lowest seed in the NCAA Tournament in school history, the upset-minded Tennessee Lady Vols defeated host Arizona State 75-64 on Sunday night. Tennessee 29 of 56 field goals, good for 52 percent, and converted on 16 of 18 free throw attempts. Arizona State shot 39 percent and hit 8 of 20 three pointers. Bashaara Graves sat a majority of the first half with two fouls, but redshirt sophomore Mercedes Russell played an outstanding first half. Russell dominated offensively scoring 12 points on multiple moves to the basket, found her teammates cutting to the basket for easy hoops and cleaned the glass, she finished with 12 points, 3 assists, and 6 rebounds. Graves finished the game with 8 points and 11 rebounds; Jamie Nared put up 11 points and snagged 6 rebounds including some crucial offensive boards. Jordan Reynolds also hit double digit scoring with 12 points, but it was Diamond DeShields leading the way with 24 points, 5 rebounds, and 3 steals for the Lady Vols. Senior Nia Moore gave Tennessee some good minutes with Graves and Russell in foul trouble and finished the night with 4 points, as did Andraya Carter. The Sun Devils hung tough with the Lady Vols at home, but couldn’t quite stick as many baskets in the hoop as Tennessee. Sophie Brunner scored 12 points, senior guard Arnecia Hawkins finished with 13, Quinn Dornstauder was able to put up 15, and senior Elisha Davis led Arizona State with 18 on the night. Davis was 3 for 5 from three on the night. Katie Hempen scored the first basket of the game for the Sun Devils but wouldn’t score again, finishing with just three points. 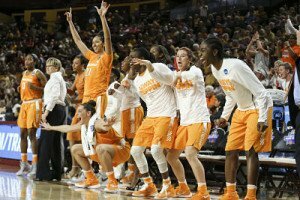 The Lady Vols handled the pressure defense of Arizona State well, committing just 12 turnovers. They also out-rebounded the Sun Devils 36-30, but once again gave up too many offensive boards, allowing Arizona State to snag 13. Tennessee has now reached the Sweet 16 in 34 of 35 NCAA Tournaments and will take on basketball sensation Kelsey Mitchell and the Ohio State Buckeyes in Sioux Falls on Friday.